Greensburg, Kansas’ decision to rebuild green after a tornado destroyed 95 percent of the small town is a dramatic example. Building owners are gaining confidence in the long-term benefits of sustainable design and showing more willingness to invest in innovative measures to achieve energy efficient goals. 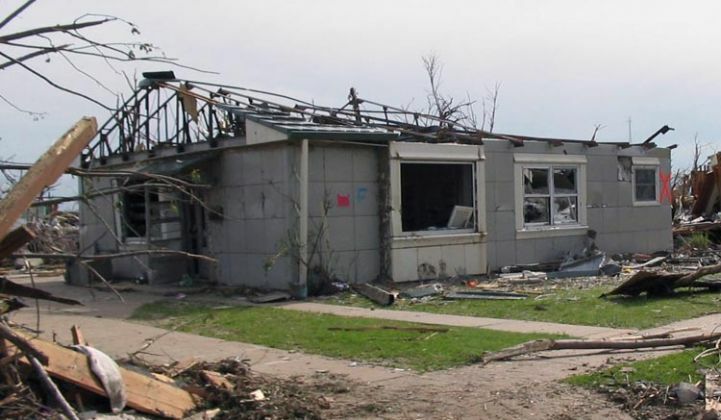 The town of Greensburg, Kansas’ decision to rebuild green after a tornado destroyed 95 percent of the small town in 2007 is a dramatic example. Five years after the violent event, the town is now saving $200,000 in annual energy costs for thirteen buildings, according to the Department of Energy. “The green building movement has suffered a lot from greenwashing, but Greensburg is now providing measured building performance that proves the benefits of sustainable design”, says Shanti Pless, senior research engineer at the National Renewable Energy Laboratory in Golden, Colo. While car pollution often receives a bad rap, buildings also create large carbon footprints, accounting for more than than 40 percent of U.S. energy consumption, according to the DOE. “Many people don’t realize that buildings consume more than 70 percent of our nation’s electricity and more than 50 percent of natural gas,” says Paul Torcellini, NREL principal engineer. So how are building owners in Greensburg and other places improving energy efficiency? In designing thirteen town buildings, Greensburg incorporated simple design features, considered most reliable, such as daylighting, high performance windows and ground-source heat pumps that accommodate passive energy savings. Its new 48,500-square-foot Kiowa County Memorial Hospital, the first critical access hospital in the nation to achieve LEED Platinum certification, includes an ultra high-efficiency magnetic bearing chiller with a secondary unit for waste heat recovery and energy recovery wheels for heating or cooling ventilation air. Including use of renewables, the hospital achieved a 59 percent annual energy savings compared to a typical existing hospital, the DOE states. Economizers can include leveraging cool outside ambient air in northern states to cool the building or using cool, dry conditions at night in warmer, dryer states for indirect evaporative cooling, Schneider says. Setting up a water-side economizer near a deep water lake can also eliminate the need for cooling using compressors. There is also heavy movement toward containment of hot air and cold air in the hot aisle or cold aisle -- an inexpensive option to deploy, Capes says. “The goal is to keep cold air where you need it and prevent hot air from mixing with cold air,” he says. He predicts state regulatory mandates supporting use of economizers will drive use of containment. NREL is taking containment a step further at its 360,000-square-foot, zero-energy research support facility by using hot air from its data center to heat the building, Torcellini says. “Most data centers throw away that hot air,” he says. Research facilities are also finding ways to meet sustainability challenges. At the Pasadena-based California Institute of Technology, the Institute for Environmental Science purchased ten heat exchangers from Cannon Design for its lab, says Gerald Williams, mechanical engineer at Cannon Design in St. Louis, Missouri. An independent study commissioned by CalTech projects the technology, designed by Cannon, will reduce the laboratory’s energy use for cooling major lab equipment by 87 percent compared with traditional chillers. The heat exchangers allow the building to use captured rainwater cooled via night-sky cooling for the HVAC system and additionally use it as point-of-source cooling for spectrometers, lasers and other heat-producing equipment in the lab. “It is much easier and efficient in terms of materials and energy to cool or heat buildings using water than forced air,” he says.